With the success of Obama’s green energy policy, why not have another round of blood-letting for the American taxpayers. After all, in what is obvious crony capitalism and campaign donation payoffs, Obama figures if we haven’t put him in jail yet, he’s free to do as he pleases. So another round of green energy funding is underway, and this time it’s for $4 billion in taxpayers “loans.” These are not “loans” any more than you can loan somebody a bite of a sandwich. There is only one way to get that bite of the sandwich back, and I guarantee you will not want it. People should be in jail for this. 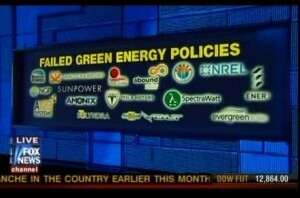 I’m all for clean energy, but not from a dirty administration.